Native American jewelry projects are a wonderful way to teach children appreciation and respect for ancient traditions, crafts, and the work of artists. 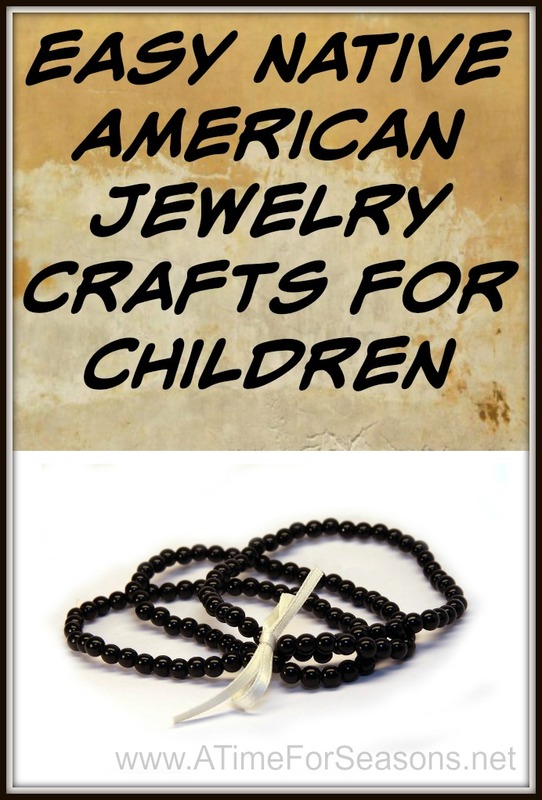 Simple Native American jewelry projects give your little ones the chance to learn about Native American history while having fun and making something they will cherish for years to come. Using hemp strands and seed beads will result in sturdy and beautiful bracelets. Seed beads pair well with hemp, but you can use whatever kind of bead appeals most to your young artist. Just make sure the bead’s center hole is wide enough for the hemp strand. Once your supplies are gathered, measure a hemp strand long enough to fit comfortably around your wrist, add a few extra inches for tying off on each end. It’s always best to go too long since the excess thread can be cut off. Tie a square knot at one end of the strand, then tape it to a flat surface to make handling easier. Add your beads in any pattern before tying off the other end of the hemp strand with a square knot. For older children, make the project more intricate by using three hemp threads and braiding them intermittently between beads. Leave a few extra inches after the beads are in place for additional braiding and then knot off the finished end. You can also make a matching necklace or anklet to create a complete jewelry set your child can wear for parties and occasions. Just cut an extra length of thread to fit your child’s neck or ankle and repeat the process for creating a bracelet. Traditional Native American jewelry artists are renowned for their work with stones like turquoise, onyx, and amethyst. To create a paper version of your favorite stone, choose construction paper similar to the color of your stone. Cut and layer the paper into a geometric shape, adding a generous amount of school glue between each layer. When your “stone” reaches a size you like, set it aside to dry. Once your paper stone has dried (this usually takes about a day), tape a sheet of coarse sandpaper to a flat surface and scrape the paper stone against the sandpaper until the edges are smooth. Paint the stone with a shiny sealant like Mod Podge to finish the project. When the sealed is completely dry, use rubber cement to attach a small metal loop to the pendant’s back, then slide the pendant onto a necklace. To help your child make a connection between these projects and the traditions that inspired them, engage your budding artist in some online research about Native American culture. For example, discovering the origins and meaning of prominent colors used in Native American art will stimulate your child’s imagination and help them discover a rich and ancient culture. You can find many beautiful pieces, engaging history, and fascinating explanations about Navajo, Zuni, Hopi, and Santo Domingo artists at Southwest Silver Gallery. Happy jewelry making! Carolyn Clarke is a freelance writer from Omaha, Nebraska. She has written for clients like Demand Media and the Omaha World-Herald. When she isn’t working on DIY projects with her two daughters, Lauryn and Lila, she’s volunteering at her local pet shelter.